I first discovered Pilates in college and remember changing my body during one summer. I simply did these same exercises at home in the evenings after work all summer. Walking has always been the way I’ve tried to stay in shape although at times life gets in the way of an exercise routine. Right now, I’m really in need of a quick-before summer shape up routine. I’ve been sitting around reading all winter and haven’t been walking as much as I should. I know, these things happen. So don’t feel guilty either. You just have to pick yourself up off the couch and get busy again. This is a new workout I’m trying out and I really love it so far. Bouncy workouts are not really my style. I prefer yoga or Pilates-inspired workouts like “The Method Series.” These Pilates exercises really do tone, sculpt and firm you fast. I mean, in days you feel like your stomach is smaller and you walk with a new confidence. The approach is simple in the first tape. Mari Winsor focuses on the 7 main exercises. This is a low-intensity 24-minute instruction video with a emphasis on sculpting and reshaping the body quickly so you can enjoy the long, thin look you might crave. You incorporate this routine into your own exercise routine. So you don't get worn out at the start: I’d recommend 20-30 minutes of walking before starting the exercises at the beginning. Mari recommends working your way to 36 to 60 minutes of walking each day. This is needed to burn calories. I started walking 20 – 30 minutes a day right after I ordered these videos to try to work my way back into a good routine more slowly. Before I was walking 60 minutes and felt too tired to jump right into a workout video. So, breaking up the walking into two times a day is more helpful in the long run. To get the most out of these exercises, you first start by mastering the basic exercises and by incorporating “secret weapons.” She emphasizes the “Powerhouse.” This is a band of energy across the center of your body. She talks about the frame of the body and breathing to increase your energy. You can also follow the “modified” routine. I like the fact that Mari allows you to take it a bit easier on the first run through. I was pleased to know that if I didn’t lift my head during all the floor exercises, it was not a sin. 7 Exercises explained in detail by Mari with tips and 3-D Training. 1. Pilates 100 – An exercise to increase circulation. You start with just breathing and slowly incorporate arms and then legs. Deep breathing helps you work your way into fitness. Soon you are doing the entire set of 100 and feeling great. 2. Roll Up – the most challenging exercise I’ve ever attempted because you normally just start from a completely flat position on your back and then attempt to fold yourself in half and reach beyond your toes. Mari gives some wonderful modifications for beginners. This is a wonderful healing exercise that lengthens the body. 3. Single Leg Circles – While on your back you make circles with one leg at a time. Easy right? 4. Rolling Like a Ball – The most fun you can have working out. I love the massage this gives my entire back. Rather invigorating. 5. Single Leg Stretch – Imagine riding a bike upside down. 6. Double Leg Stretch – You will feel like a ballerina while still flat on your back. Hard to explain. 7. Spine Stretch Forward – A gentle stretch. If you feel like you are gliding over the earth after this first workout: No, it is not your imagination. You will feel like a goddess. I adore how I felt the first time I did this workout and still love it. This is sequenced to help you reshape your body quickly. It contains fundamental Pilates exercises performed in 20 minutes. You will be targeting every area in your body with controlled and orchestrated movements. Pilates 100 – You start each set of exercises with this easy to learn breathing exercise. This is a “fast paced” intermediate to advanced workout called “Accelerated Sculpting” with 28 different exercises with multiple reps, mixed tempos and varied sets for interest. This is more intense, yet still enjoyable and is 52 minutes. It is amazing how you can work up a good sweat all while flat on your back or stomach. I loved the lavender outfits in this video. I’ll probably do this one instead of the second one in the future unless I only have 20 minutes. I think the first two videos just help you build confidence and the third video is the one you will use the most, unless you don’t have the time to work out for an hour. Otherwise, you can alternate between the videos. First you are standing and then you work into the Pilates 100 and you are back on the floor. In this video, you will also be on your stomach. The other two videos have you on your back and side. Roll Over – great for stretching out the spine. (6X) It took a real effort to do these at first. Give yourself time! Little Piece of Heaven – stretching! Swimming – On your stomach flat on the floor. Saw – One of my favorite exercises. The Teaser – Oh boy, now we are really getting into the exercises. Probably the third most difficult because of the balance factor. Once you can do this, you are officially a Pilates goddess. I still fall over on occasion. Thankfully, you only have to do three! Bent Leg Tease (4 sets for each leg) – Less intense than the teaser? I think. The Mermaid – My all-time favorite Pilates move. off the floor on one hand. Tricky, tricky. The seal – A similar exercise like rolling like a ball, but more fun. Also look for the “Winsor Pilates Targeted Series” which is perfect for a busy schedule. The compact workouts are targeted for your specific objectives. Mari also includes a small book called: “The win in 10 Meal Plan.” She talks about what you should and shouldn’t eat and how to balance all the information into satisfying meals. There are recipes and tips. She tells us to eat an orange instead of just drinking the juice or that fat does not make you fat and in fact, it takes dietary fat to burn fat. There is also a “Winsor Dozen” pamphlet so you can take 12 exercises with you when you are traveling. I’m going to laminate mine! The ten week sculpting journal is only a small version of her workout journal also available here at Amazon. Using these videos is a way to reap the same benefits Mari Winsor’s clients enjoy. These exercises really helped to boost my self confidence, because you start out at your own pace and work your way into fitness as you feel you can do the exercises. Mari has created a customized program to help you reach your weight-loss and fitness goals She recommends you using the 20-minute video three days a week and the Accelerated Sculpting video twice a week. Then, you can do the Winsor dozen on the weekend. That is 6 days a week! The maintenance routine is at least 5 days a week. What is amazing is how fast these exercises really do work and how uncomplicated they are. There are no fancy moves to confuse. In the first few days you are really feeling the burn and feeling like you are making progress. This video series makes you feel like you are one of Mari Winsor’s clients because she really takes you through the process step-by-step to build your confidence. You can do this! This is probably the most “likeable” series of exercises I’ve ever tried. I really think this program could work for almost anyone. Mari Winsor enjoys helping people transform their bodies and for those of us who are just discovering the benefits and FINALLY seeing some results, we are especially excited about the fact that Mari has organized a program for us to help us transform our bodies. to reflect and move in the moment. the program to list when searching for Mari Winsor at Amazon. I would like to see this book in a “spiral bound” version because you will want to be able to keep the pages open. This is a book you want to use, not just read once. I would also like to find a Pilates wall chart. No luck so far. The exercises in this book are all in Mari’s Body Sculpting program. To do these exercises correctly, I find it is essential to watch the videos first. Then, you can use this book to remind yourself of the exercises while doing other fun things like watching movies. The journal is also useful as it has a beginner to advance routine and you can follow the lists. I’ve thought about cutting out all the pictures in the book and pasting them onto note cards and placing them on a key ring so I can have the exercises all in a row. This might be what I resort to if I can’t find a chart. The reason I personally love this method of exercising is because I can do the exercises while watching TV or a movie. This book is going to tell you all the basics you need to know. The explanations do go into more depth than even on the videos. Yet, I think to appreciate the program, it is best to watch the videos first. Introduction: Find out who Joseph Pilates was and why he was a revolutionary force in the world of fitness. 1. The Joy of Movement – What are the benefits? These are rather convincing. If you are stressed out by other routines, these exercises provide a loving, nurturing environment in which your body can change. You feel that you are really caring for yourself. 2. Principles of Understanding – Learn about breathing, relaxation, concentration, control, fluidity, strength, flexibility, freedom and control. There is a certain joy in the opposites presented in these exercises. You stretch and tone. You relax and work out. There is a certain balance you achieve through each routine. 3. The Powerhouse – The secret and essential ingredient. I didn’t really understand fully what this was until reading this book. There is not enough time on the videos to go into depth. That is why this book is essential! 4. Before You Begin – More motivation and pep talk from Mari. I love her style. I love the way she can convince me to get down on the floor and work out. What a woman! 5. Pilates Mat Work – These are the exercises. A full list of 41 ways to firm, tone and stretch. All the exercises are shown with complete detailed explanations. Most have a “prep, ready and action” area. Some only need a “ready and action.” The instructions are easy-to-understand, but to fully understand them, I again recommend the videos. So worth the price. 6. Defying Defeat- If you have been injured and are in pain, Pilates might be the perfect remedy for healing and diminishing chronic pain. I know it has helped my back and my entire body feels stronger. 7. Neck Injuries – Neck stretches you can do to alleviate pain. When first doing these exercises, you will notice some tension in your shoulders and neck, but that quickly subsides as you build up muscles to support your head. There are also variations so you don’t have to lift your head as much when doing the exercises. Of course, you want to work to that level. 8. Lower Back Pain – Stretches and modifications. “Rolling Down the Wall” is a fun exercise to stretch out your lower back. 9. Asthma – interesting to have included this in the book. But asthma is actually very common. Breathing through your nose is what Mari recommends. I’ve heard that cold air on the back of the throat can actually aggravate Asthma. Exercise induced Asthma is a reality. 10. Beyond the Mat – Look for a Pilates studio. The equipment can help give you a deeper stretch and added resistance. In this section, it would have been nice to see the exercise machines. She gives a toll-free number so you can call and find a studio in your area. A Balanced approach to Life and Exercise. Pilates is a form of exercise named after "Joseph Pilates" who invented this scientific system of body conditioning over eighty years ago. Frankly, I've never seen such fast results with any exercise program. I'm amazed and my husband has noticed the difference in my body (which is in sore need of a fast exercise remedy after a winter of reading, reading and more reading) in the past few weeks. If you have yet to try the Winsor Pilates workout tapes, prepare to be amazed. With that said, I thought it would be interesting to record my progress in a journal. 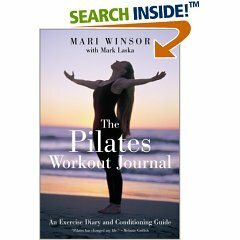 Mari Winsor has created a journal just for Pilates. Why should I use a workout journal? How to use The Pilates Workout Journal? The evolution of Pilates - a fascinating history! of the exercises, no instructions. This is a book where you can write your thoughts about activities that rejuvenate your mind and body. You can keep a journal to make notations about which exercises you performed and how many different parts of your body felt the effects. Mind & Spirit - Ideas, insight. Challenges - Areas that need improvement. Coordination & Balance - Positive thoughts and notions of progress. Endurance - Physically taxing or energizing? Strength & Flexibility - How did your workout feel? Energy? Did any part of you body feel weaker? If you have purchased the Winsor Pilates video workouts, this is an essential companion to the set. I can't believe they didn't include this book. 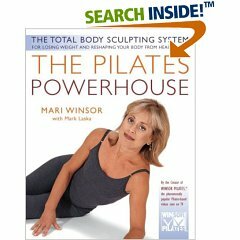 It explains Pilates in such detail and gives all sorts of background information on Mari Winsor. Fascinating. Worth buying just for the Pilates information! I hope that with this journal I can keep on track with my workouts and New Year's resolutions. Throughout the book there are little inspirational passages to keep you motivated.